Days 1 – 8 of the Tour de Fleece were all about spinning the lace project for my friend, Teresa. The progress was starting to go to my head and I wanted to give my hand muscles a new set of movements. Repetitive stress is not a syndrome that I want raining on my parade. So, I set the spindles aside, temporarily and sat at my new (to me) wheel. This is a Fibre Garden ‘sock blend’: ¹⁄3 each of mohair, merino, alpaca. I have 103 g, and have already spun half to 113 yds of 3-ply. 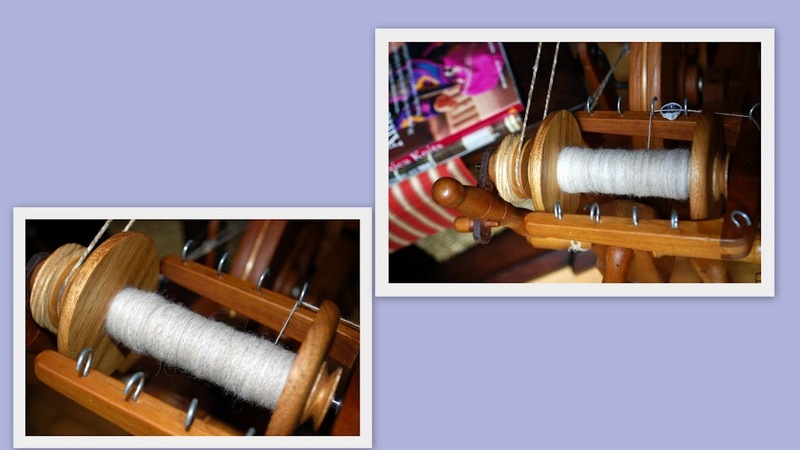 Today, I spun these 2 bobbins and ½ of the 3rd. She is custom Butternut from a tree that Mr. Watson had on his property in Ontario. My friend loved the colour, and the lighter weight of this white walnut wood. I cleaned her with a solution of Murphy Oil, and then rubbed her down with a tung oil. As my friend always said to me, “This is not a wheel for a beginner.” It could be for ease of treadling, and stopping on a dime, and minimal oiling. The drive wheels need to be carefully aligned with the bobbin & flyer array. If anything’s off this wheel makes a noise. If all is well, she sings. I have the 4 original matching bobbins, and have now used both whorls. The maker has taken a brilliant old design of using 2 smaller drive-wheels to be equivalent to having a single large, space-sucker-upper drive wheel. He didn’t just reproduce that. He made it as a beautifully-crafted modern wheel. It has sealed ball bearings. I have hopes it will make a good Helix Scarf. Categories: Spinning, Stash in; Stash out, Tour de Fleece | Tags: handspun yarn, Spinning, Watson Martha spinning wheel | Permalink. Just read your blog entry about your ‘Martha’ wheel. I used to live near the Watsons, and have tried several of their wheels — but the Martha is definitely my favourite. You are SO lucky!!! These never seem to be available used. If anyone ever offers you another one, I’ll be glad to take it off your hands!